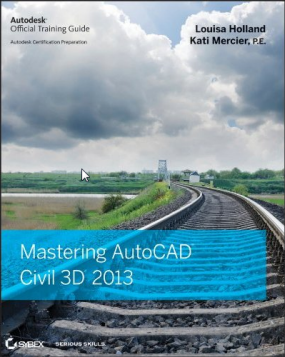 Using Autodesk’s AutoCAD Civil 3D Parcels makes short work of conventional subdivision layout, as well as more intricate work like overall parcel boundary divisions and phases. One thing we always try to adhere to is the foundation rule of working form an overall region towards more defined smaller regions. 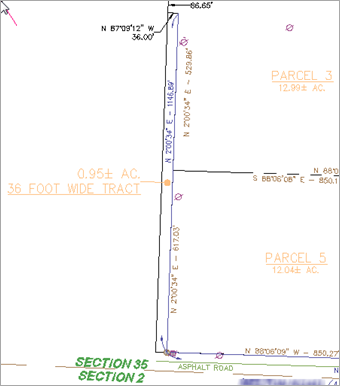 This requires an initial parcel to be established on a site before more can be divided. During the creation, Parcel Segments are created in the background, and remains invisible and harmless until you want to do some fancy footwork. That’s where we come in. Let’s say one of your retention parcels is to be developed in another phase, and the client absolutely does NOT want that parcel, or even the outline to be visible. Good Luck. 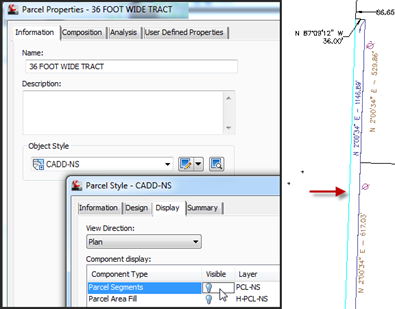 No matter what you do, the original defining Parcel Segment remains visible is some manner or another. I’ll go through how to solve this, using this ’36’ wide parcel’ as an example, and point out a few things along the way. I’d like to remind you is that no matter whether you do this on a single site, or copy your development phase off to another site, the defining Parcels Segments will always be there. The first thing to do is to shut off the Parcel Area style display. I like using a ‘No Show’ style (NS), but layers work well too. 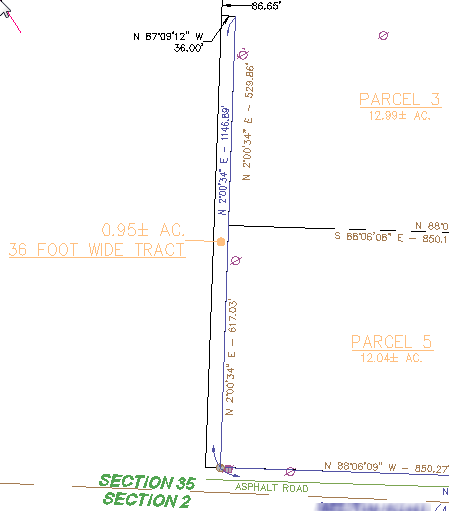 The result will be similar to what happened in the image to the right: The Parcel Area Label, as well as the Parcel line-work coloring are gone, however the base Parcel Segments remain visible. 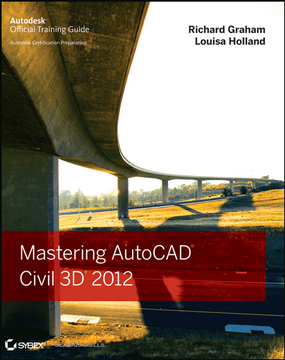 The good news is that EVERYTHING in Civil 3D is run by a style. Here, some style is in charge. The trick is to find it. Navigate through the Prospector, expand the site that you are working in, and right-click the Parcels collection header. Then pick ‘Properties’. On the Composition tab, the style display order will show all the styles associated with any parcels in this site. In my example, ‘Standard’ is at the bottom. I know I never use this style, so what’s it doing here? 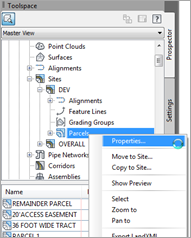 At the top of the dialog, you will find the Site Parcel Style pull-down. 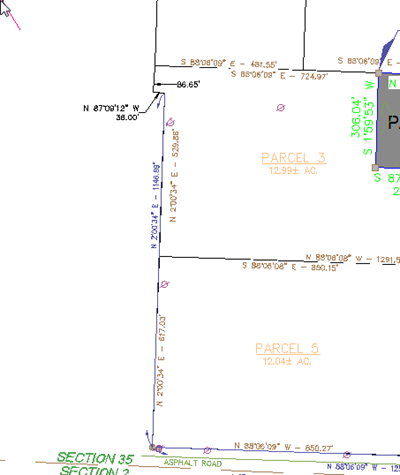 This sets the basic style of the Parcel Segments associated with this site. 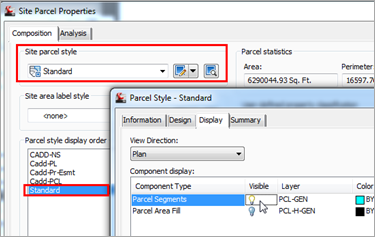 When all the properties of any Parcels are shut off, you still have the basic, persistent display of the segment style. So what I demonstrated above is to shut off the display of this basic segment style. (I know the light bulb is show ‘visible’ but turn it off, and the segments disappear). An alternative, and slightly more constructive, is to change the ‘Site Parcel Style’ I mentioned, from ‘Standard’ to ‘No Show’. They you have better control, and the intent is clear to everyone. The results are the same. Now the Parcel is gone, and the outline with it. Notice that all the other parcels are fine.